What Really Is Nevada's Loneliest Road? Years ago, Life Magazine made U.S. 50 in Nevada famous. 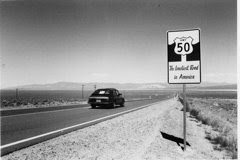 In the late 1980s, Life called U.S. 50 in Nevada the “loneliest road in America” and indicated that travelers needed survival skills to make the trip. The towns along the route quickly capitalized on the description and, working with the Nevada Commission on Tourism, developed a tongue-in-cheek “Highway 50 Survival Kit” (still available from the Commission on Tourism) as well as t-shirts, bumper-stickers, highway signage and other souvenirs. The promotion was an immediate success. At last count, more than 60,000 survival kits have been distributed. Additionally, there have been travel books and numerous magazine and newspaper articles about taking a trip on the loneliest road in America. But is U.S. 50 really the loneliest road in America? According to a recent Nevada Department of Transportation’s road count book, U.S. 50 is far from the loneliest road. In fact, at its loneliest spot, near Austin, the road is traveled by an average of 640 vehicles per day. 1. State Route 121 from U.S. 50 to Dixie Valley: This is the real thing—the loneliest road in the state. According to NDOT’s records, a mere 10 cars travel this 27-mile stretch of road on a daily basis. And you have to wonder—where the heck are they all going? 2. State Route 320, the Caselton Loop: This 12-mile section of pavement is driven by 45 cars per day—all catching a glimpse of the ruins of the early 20th century mining town of Caselton, located seven miles east of Pioche. 3. State Route 722 from Eastgate to Austin: This lightly-traversed 58-mile long highway, which used to be part of U.S. 50, also sees about 45 vehicles per day, which is too bad because the ride over Carroll Summit is quite lovely. 4. State Route 844 from Gabbs to Ione: This 16-mile ribbon of asphalt, which turns to dirt for the last third, sees about 50 vehicles per day. Despite the fact that this is the main road to Berlin-Ichthyosaur State Park there just aren’t too many traffic jams out here. 5. State Route 379 from U.S. 6 to Duckwater: This 20-mile road leading to the Duckwater Indian Reservation, noted for its geothermal catfish farm, handles 75 cars daily, or about one vehicle every 19.2 minutes. 6. State Route 317 from Caliente to Elgin: This drive through magnificent Rainbow Canyon is scenic but uncrowded. NDOT finds only about 100 cars take this beautiful journey each day. 7. State Route 140 from Denio to the Oregon Border: This remote, 44-mile road accommodates 120 autos per day and lots of cattle. Along the way it skirts Virgin Valley, home of the exotic black fire opal—the official state precious stone—and passes the Sheldon National Wildlife Refuge. 8. State Route 377 from State Route 376 to Manhattan: No surprise here since State Route 376, the road between Tonopah and Austin, is one of the state’s most remote highways and Manhattan is a faded mining town that has more ghosts than people. Only 120 vehicles travel this road each day. The trip, however, is worth it because Manhattan boasts a handful of picturesque buildings including a quaint wooden church on the hill above the town. 9. State Route 375 from Warm Springs to Rachel: Since Rachel is the self-proclaimed UFO capital of the world, it’s clear from the traffic counts that extraterrestrials far outnumber earthlings. Daily traffic on this 62-mile stretch includes only 125 human vehicles—and an unknown number of alien crafts. 10. State Route 264 from Coaldale to Oasis, California: A paltry 190 vehicles travel each day on the 40-mile, two-lane byway that passes through Dyer and Fish Lake Valley. A highlight is the view of Boundary Peak, to the west, which at 13,140 feet is the tallest point in Nevada. Go check out some of these roads—you can make them less lonely. Anyone who has wandered much in Nevada easy recognizes the state’s official flower—a shrub known as Artemisia tridentata, or sagebrush. The scruffy green-gray bush thrives just about everywhere in the Silver State—one web site claims it covers as much as 40 percent of the state. It is so prevalent that one of Nevada’s nicknames is the Sagebrush State and two sprigs of this aromatic plant appear on the state flag. But that doesn’t mean it’s always been loved. The Donner Party and other pioneering travelers were forced to hack through miles of sagebrush and greasewood terrain on their ourneys across the state and writer Mark Twain wrote disparaging remarks about the noble plant on several occasions. 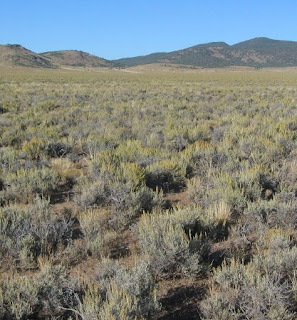 According to the University of Nevada Cooperative Extension, there are at least a dozen different species of sagebrush found in the state including the Basin big sagebrush (Artemisia tridentata). This particular shrub is silvery-gray in color with yellow flowers and can grow as tall as 10 feet, although most are in the 1-to-3 foot range. The plant, a member of the wormwood family, is notable for its strong pungent odor, which is particularly acute when wet or when the dried plant is crushed. Some scientists believe the sagebrush’s distinctive fragrance is a natural defense to keep animals from wanting to graze on its branches and leaves. In fact, most livestock don’t care for sagebrush; pronghorn antelope seem to be the only larger animal that doesn’t mind nibbling on its leaves. None of this is to suggest that the bush doesn’t have its uses. Native Americans reportedly used sagebrush to halt internal bleeding (usually following childbirth or injury or trauma as a result of fights) and it had value as a topical dressing to treat infections. The plant was also used by Native Nevada tribes to weave mats. Faint praise but praise nonetheless. When most people think of Elko, they usually associate it with either ranching or mining because it is the home of the annual Cowboy Poetry Gathering and near some of the world’s largest gold mines. But if you look closely at the town’s history, you find that its roots had more to do with transportation than with ranching or mining. The first non-Native American to visit the Elko area was explorer Peter Skene Ogden, who traveled through the region during a beaver-hunting expedition in 1828. About a decade and a half later, wagon trains began passing through and camping near the future town site on the route that would become known as the Emigrant Trail. The actual community of Elko wasn’t established until late 1868, when the Central Pacific Railroad was building its transcontinental rail line through Nevada. The railroad selected the site as a railhead and freight terminus because of its proximity to several mining camps, including Lone Mountain and Tuscarora. Additionally, Central Pacific Railroad officials named the settlement “Elko” by Central Pacific, allegedly because Charles Crocker, the railroad’s superintendent, had a penchant for taking animal names and adding an “o.” The story, however, may be apocryphal. By early 1869, tents had been erected on lots sold by the railroad and the town began to blossom. 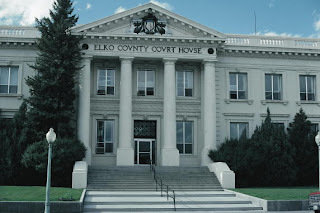 In March of that year, the Nevada State Legislature designated Elko as the seat for a new county of the same name, which virtually assured the town’s success. The town’s first courthouse, a fine two-story red brick structure in the Greek Revival style, was erected on the main street (called Idaho Street) in December 1869. By 1870, Elko had grown to 2,000 people and boasted a newspaper (the Elko Independent) as well as more substantial homes of wood and brick. In 1874, Elko was designated the site of the first University of Nevada and a substantial brick college was built later that year. 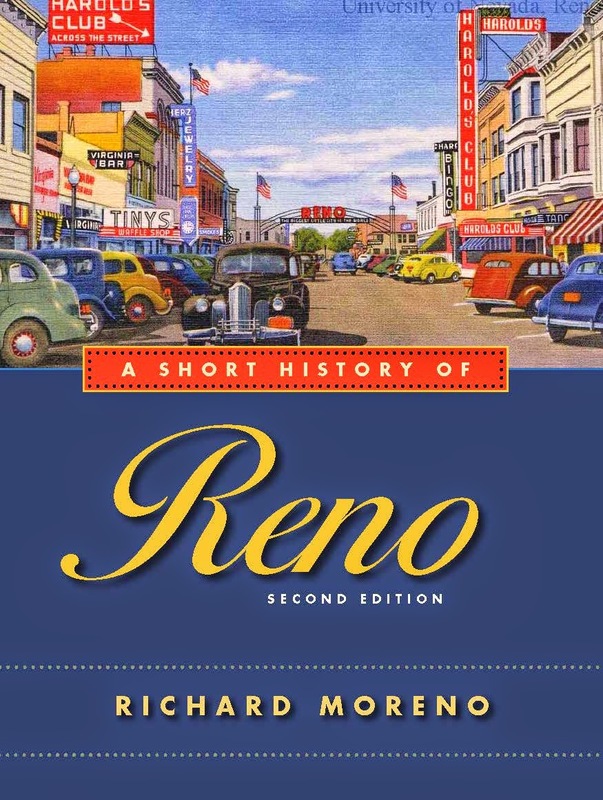 The town’s remoteness, however, limited its appeal and the university was moved to Reno in 1885. The town continued to prosper as a transportation center during the late 19th and early 20th century. Additionally, during this time ranching became an integral part of the local economy with the development of large cattle and sheep outfits. By the 1890s, the latter had attracted a large number of Basque sheepherders. To cater to these newcomers, Basque boarding houses cropped up in the town. Later, these establishments opened their dining rooms to the public and today Elko has several fine Basque restaurants. During the early part of the 20th century, Elko remained an important railroad stop for Western Pacific and Southern Pacific trains. Additionally, in 1920, Elko was selected as one of the stops for the first transcontinental airmail service. Another first occurred in Elko in 1941 when Newton Crumley, owner of the Commercial Hotel, booked entertainer Ted Lewis and his orchestra for eight days. It was the first time a Nevada hotel-casino offered entertainment and foreshadowed the popularity of today’s casino headliners. In more recent years, Elko has gained fame as the site of the annual Cowboy Poetry Gathering, sponsored by the Elko-based Western Folklife Center. In late January, the event attracts more than 8,000 people. In the past decade, substantial gold discoveries in the region have doubled Elko’s size (an estimated 20,000 people live there today) and transformed the former cowtown into a mining boomtown. The recent changes, however, haven’t wiped out the town’s historic beginnings. Wandering the streets, it’s still possible to find plenty of reminders of the past. For example, several homes on Court Street (one block from Idaho) date back to the town’s earliest days. The Dewar House at 745 Court was built in late 1869, soon after the town was established. Down the street are other interesting historic buildings, including: the Bradley House (643 Court), built in 1904 by John R. Bradley, son of Lewis Bradley, Nevada’s second governor; the Map House (4th and Court) built in 1869 and the oldest home in Elko; and the imposing Pythian Castle Hall (421 Court), built in 1927 for a fraternal order. Additionally, the Elko County offices (6th and Court) are located in former Elko County High School building, constructed in 1895, which is said to have been the first public high school in the state. The Elko County Courthouse on Idaho Street was built in 1911 to replace the original, which had grown too small. With its Neo-classic style design, including four prominent Tuscan-style columns supporting a large portico, it is one of the most impressive halls of justice in the state. Elko’s business district still has several historic commercial structures including the venerable Commercial Hotel, which dates back to 1899, the Pioneer Hotel building (now home of the Western Folklife Center), built in 1912 and the Henderson Bank (4th and Railroad), built in 1929. Of special note is the J.M. Capriola’s western shop (Commercial and 5th), which houses one of the state’s oldest and most famous saddle shops, the G.S. Garcia shop. An excellent source of historical information about Elko is the Northeastern Nevada Museum, 1515 Idaho Street, Elko. The museum is open Monday through Saturday, 9 a.m. to 5 p.m., Sunday, 1 p.m. to 5 p.m. For information call 775-738-3418.